This is the last week of the Sumida Aquarium’s special tribute to goldfish. Forget what you’ve heard that they only have 3-second memories and admire the majesty of these tiny, shiny, big-eyed fishies. The goldfish enjoyed popularization in the Edo-period, and Goldfish Wonderland celebrates this. 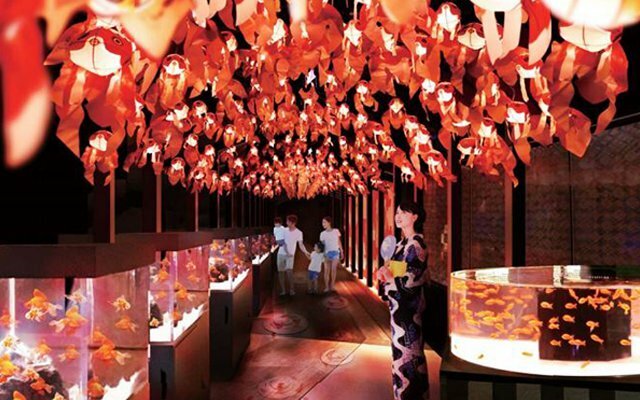 There are 31 fishtanks showing different breeds of goldfish, as well as glowing ceilings full with goldfish lanterns and paper balloons. There will be activities for children, such as DIY T-shirt printing using fish-shaped stamps. Refreshments are also goldfish themed (don’t worry, they are used as inspiration only). You can order a bright orange Goldfish Cocktail for ¥550, or a Goldfish Soda which is served in a fish bowl for ¥750. You can even take the bowl home with you if you like. It’s on at the Sumida Aquarium on the 5th and 6th floor of the Tokyo Skytree from 9am-9pm daily.